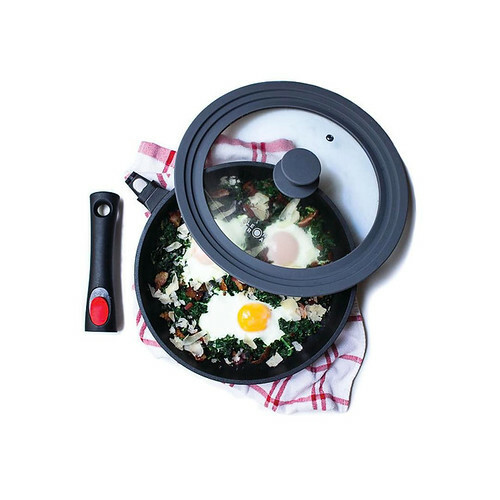 Nonstick Fry Pan with Detachable Handle and Glass Lid - 11"
Revolutionary detachable handle frying pan with smart, multi-functional design that will surely give you a different kind of cooking experience. Space-saving superior nonstick fry pan – truly a great investment for your kitchen. Get this premium quality Non-stick Fry Pan with SecureSnap Handle & Large Clever Lid now, & enjoy trouble-free cooking starting today! Universal lid is made with high heat-resistant FDA/LFGB approved silicone rim, tempered glass for visibility, steam vent, & cool-touch elevated handle. This is a universal cover which fits 9.5, 10, & 11 inch sized pots & pans.